Immigrants from Germany we came in 1973 to Kateleios, to start a new life in our country, our village, to our land. My husband Nick and I, both our children Evangelia "Litsa" 5 years old and Konstantinos 'Kostas' 2 1/2 year!! we wanted to live with our children in an environment with clean pure air and a wide blue sea! We started with thousands of beautiful dreams our trip back home, owning only a taxi and all of our pockets empty. We found here in Katelios from both of our grandparents a small house .. the dream had just started! Our aim, to make this small house with two traditional dens, a shop, coffee shop as you rather say. We opened and we were expecting our first conversations. "Electricity" back then didnt exist... and we did some hard work carrying ice from Argostoli (the capital) 30 miles away and we did that every day for many years. 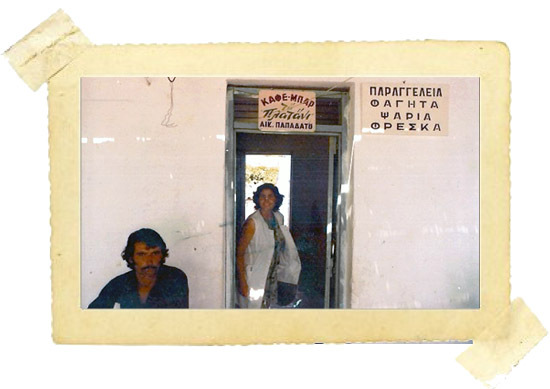 So things were in good shape and our struggle lasted 5 years until 1978, Then came the electricity for the first time in Katelios (we had to struggle a lot to get this done). In our small shop with some few tables and chairs we offered many products also that we produced on our own, like potatoes Onions, tomatos, wine, garlic, herb, oil, we even had homemade Hindi. 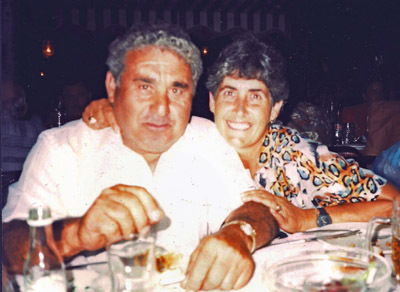 Our family and our grandfather Gerasimos help us a lot in our gardens. In our courtyard of the restaurant we use to make a nice tent from straw that we accumulate in the summer and in the winter we had to knit it. 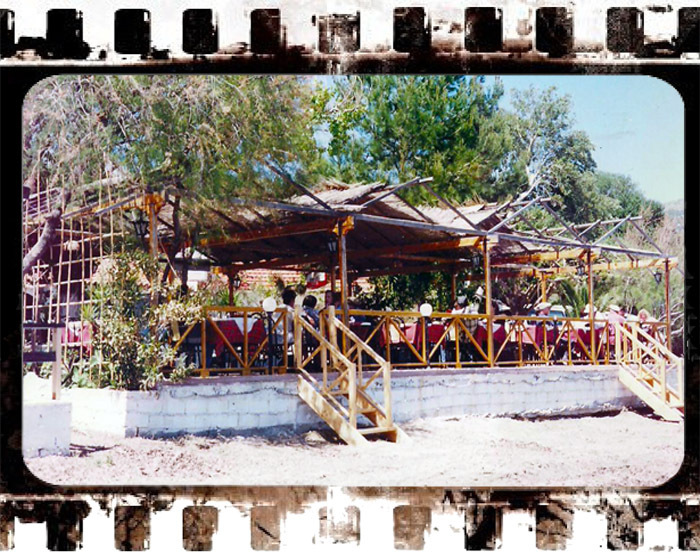 In 1978 we decided to build a new building more modern and functional ... so our dream slowly took shape! We were running for all the permits and all of the paperwork that needed to be done, and getting in builders and materials, so then we began a new adventure in our lifes. The foundations were done, and building finished really quick and in May 1978 we worked for the first time in our new shop! The children grew up and helped us out in whatever they could do ... we did all the work, we served, cooked, wash the dishes, we made all the grocery and in between we did some fairs with no taxi!!!! 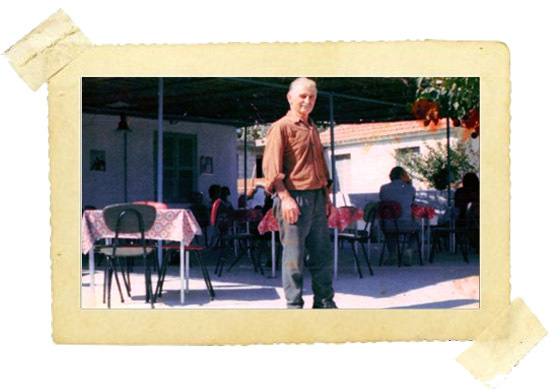 Katelios had a modern restaurant, a pride for the village. as for those years there were only two more stores! We had a very good clients and famous and non-famous people, but also had many foreigners, Italian and German, we were talking German and Italian preaty well! The whole family was working now in the restaurant our children had grown up a lot. 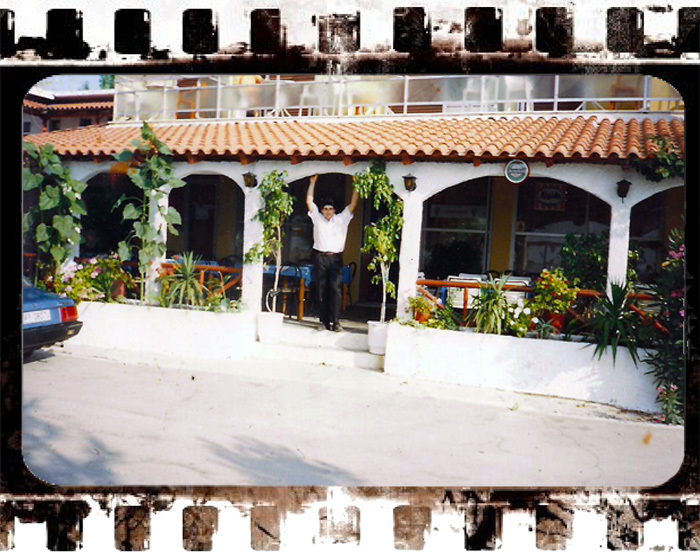 In 1990 we did one more renovation and we we tired working all these years and so the parents left and gave our boys now all the priorities of the restaurant! Makis Cooked (he also he studied and become a sef) and took over the kitchen and Kostas all of the rest of jobs of the store! We now only help them with gardening and we fish them also fresh fish. Our dream had become a reality and in 2005 our children on their own now have done a new renovation and gave the place a new name lighthouse. Today the lighthouse is the jewel of Katelios and waits for you to visit it! Mother of Makis and Costas .. Send us a message to stay at our Studios with your desired room type, arrival date and number of nights you'd like to reserve, and we'll contact you in no time to arrange that for you! You can also give us a call! !